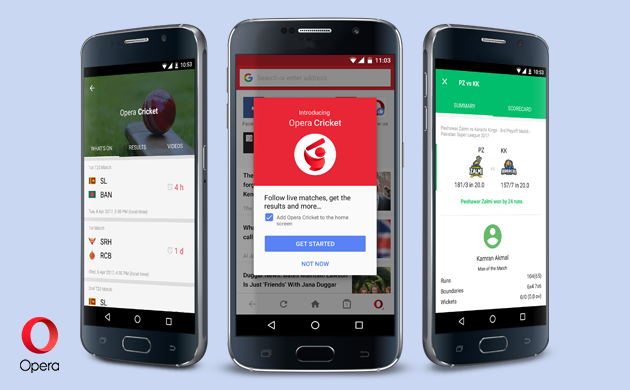 Opera Cricket: The Opera Cricket has been rolled out in India, a service that provides users with cricket scores, commentary, video as well as notifications when on the move. It is available in Opera Mini browser for Android Devices. Opera Mini users will need to upgrade to the latest version of the browser to start using Opera Cricket services. After upgrading, users will be shown a ‘Get Started’ banner to activate this feature. The Users can subscribe to each upcoming match to get a notification when the game begins. Just toggle the button to the left of the selected matches to receive the start time notification. There is also match highlights window that provides all the information such as live scores of T20 Matches, Test matches, and scorecards of the players as well.Users can stay updated with match statistics and breakdowns of the scores secured by the players. Regarding the new feature, Sunil Kamath, VP of South East Asia Pacific, Opera Software, said: We Indians live and breathe cricket, and we don’t want to miss out any match. Opera Cricket embedded inside the new Opera Mini browser offers instant access to all the cricket updates. This is the fastest way for millions of Opera Mini cricket fans to stay on the top during this cricket season.